All of our trainers see clients one-on-one and develop custom plans based on each individual’s goals and exercise history. You won’t find any cookie cutter programs here. 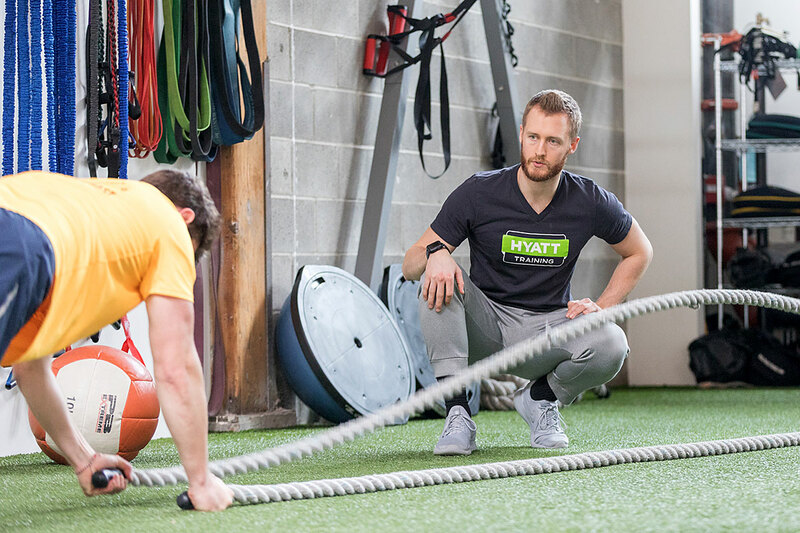 Our trainers are independent contractors* and set their own schedules and prices, but you can expect to pay ~$300/month for each hour you spend with a trainer per week (roughly $75/session). All clients also have a $35/month studio membership fee that includes access while you’re with your trainer plus access to the studio during open hours. * Pricing varies among Hyatt Training personal trainers because it’s relative to each trainer’s experience and specialties. All Hyatt Training personal trainers are independent and determine their own rates and schedules. Exact prices, packages and additional details will be discussed during your free personal training consultation. Get started today! We offer a free, 60-minute consultation for new and prospective clients. We’d love to talk to you and learn how we can help you reach your fitness goals! Schedule your consultation online or contact the studio directly. Owners Jeremy and Lee will work closely with you to select the best trainer to help you reach your goals. That personal trainer will contact you directly to schedule your complimentary consultation. Read the inspiring stories of some of our clients! Nope! We keep things simple and straightforward at Hyatt Training. If you like what you see, try us out. If you change your mind, we’ll understand. Are there any sign up fees or initiation fees? There are no sign-up fees, initiation fees or any other hidden costs at Hyatt Training. We want to make it easy for you to workout with us. Are there other training packages available? Perhaps a monthly plan doesn’t work with your lifestyle because you travel a lot. No worries! We can create a package tailored to your particular needs and schedule. Exact details can be discussed during your free personal training consultation. When you sign up for a monthly package, you get access to posted workouts designed by our highly qualified personal trainers. New workouts and exercises (i.e., strength sets, mobility sequences, high intensity interval training, bike workouts and runs) are posted every week on our boards. These accessible workouts take the guesswork out of what to do when you get to the gym. They incorporate foundational exercises that have a mix of multi-joint upper and lower body sets using all planes of movement. If you need guidance, our personal trainers are available to answer brief questions and demonstrate the exercises. Can I do a single session with trainer without signing up for a monthly package? Yes! Single session or hourly consultation rates vary based on each trainer’s experience* (see above). No problem. Just let us know in writing by the 20th of the month prior to your cancelation.